Last May the husband and I decided that we really should do something about becoming a bit healthier. He was pretty good on the exercise front, but we both needed to lose some weight. So I signed up for Lean & Learn, a health and fitness programme designed around balance. Balance is very important to me, because if I’m to make any kind of lasting change around what I eat and how much I exercise, then it has to include wine, Kettle Chips, and chocolate. Those things are not negotiable. I’ll write more about Lean & Learn another time, but one of the things it made me do was look at the snacks that accompanied our weekend wine habit. When I added up the calories and examined the nutritional value, I was pretty shocked. So I looked at what I could substitute some of our unhealthy choices with. One of the things I did was to swap some of my Kettle Chips for crudités, but I still needed some healthy dips. I started buying the tiny tubs of Philadelphia Light, but found it was a bit boring. So I bought a bigger tub to make a dip with. And so my cream cheese tzatziki was born. I didn’t set out to make a tzatziki equivalent, but my Greek-Australian husband’s influence obviously goes deeper than I like to admit! I now use Philadelphia Greek cream cheese, because it’s lower in fat and higher in protein, and it also tastes a bit creamier. 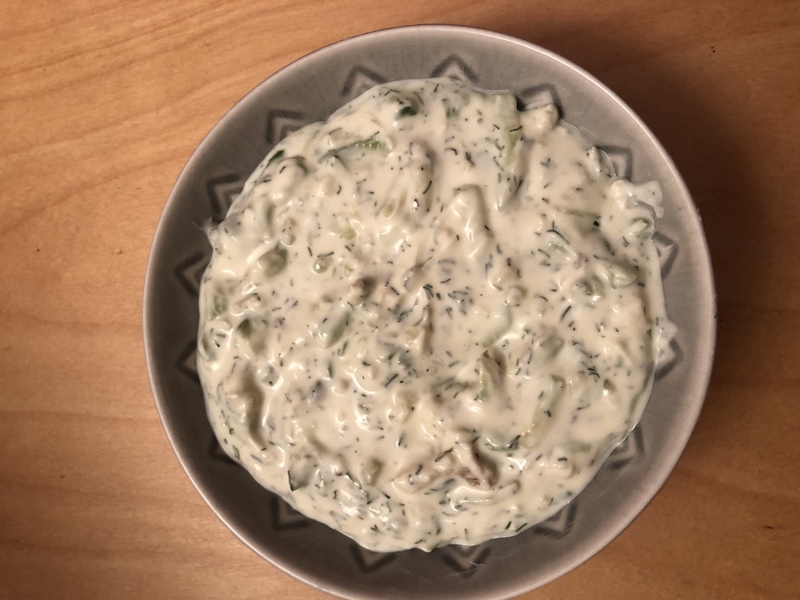 When I first made the dip I didn’t put grated cucumber in it, and even now, if I’m feeling lazy, I sometimes just serve it on the side as a crudité. Anyway, if you fancy making the dip, here’s the recipe. NB: if you’re planning to kiss anyone after eating this dip, make sure they have some too…. Garlic – the number of cloves will be down to your personal taste. I recommend starting with one and then adding more until you get to your own, personal garlic tolerance level. Mine is quite high so I usually use around three or four cloves. 1/4 cucumber if you’re going to grate it, 1/2 if you’re going to use it as a crudite. 2. Add the tub of cream cheese and a slug of olive oil to the bowl. 3. Grate the garlic, or use a garlic press, and add it to the bowl. 4. Add a generous pinch of salt and a pinch of pepper. The salt is very important as it brings out the flavour of the garlic. One time I forgot to add the salt and kept adding more garlic. Then I remembered the salt and the amount of garlic just about blew even my garlic-loving head off. 6. Mix everything together and then taste it. Add more garlic and dill if necessary until you like how it tastes. 7. Decant the dip into a pretty bowl or ramekin. Here’s a picture of some I made last week. Enjoy! I hope you like it! Nice with thin crispbread broken into shards to dip. And a nice chilled glass of wine!